Queer Quotes is a compendium of wit and wisdom from well-known historical and contemporary cultural figures. Often amusing, the quotes are also thought-provoking and have an impressive scope. Subjects range from love and gay marriage to HIV/AIDS, from gender identity to religion, and everything in between. 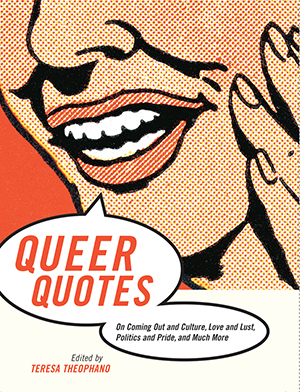 Featuring more than 350 quotes as well as short biographies of all the individuals quoted, Queer Quotes is an essential resource and an ideal gift book. Paula Gunn Allen, Dorothy Allison, Pedro Almodovar, James Baldwin, Tallulah Bankhead, Simone de Beauvoir, Sandra Bernhard, Chastity Bono, Susie Bright, Truman Capote, Kate Clinton, Ellen DeGeneres, Melissa Etheridge, Leslie Feinberg, Harvey Fierstein, Barney Frank, Jewelle Gomez, Larry Kramer, Liberace, Greg Louganis, Audre Lorde, Sir Ian McKellen, Isaac Mizrahi, Boy George, Armistead Maupin, Martina Navratilova, Adrienne Rich, Marlon Riggs, Eleanor Roosevelt, Urvashi Vaid, Gore Vidal, John Waters, Edmund White, Oscar Wilde-and many, many more. "Teresa Theophano's collection is a wonderful collage of queer wit and wisdom over the past century." "Theophano has collected quips, cracks, gibes, proverbs, truisms, and plenty of other sayings in Queer Quotes."